White Night first came to my attention during E3 last year, where the black and white survival horror game from OSome Studio looked like it was not only going to pay homage to Alone in the Dark and the traditional genre style but also offer up some tricks of its own with a distinctive film noir vibe. 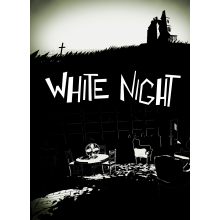 It isn’t uncommon for developers to go for eye catching visual styles to try and distinguish themselves in the crowded PC/console spaces, but White Night was of particular interest as so many games with the “survival horror” tag these days have seemed a bit more action focused. Now that it has been out for a little while, has OSome’s final product been able to live up to the promise it showcased almost a year ago? As you play through White Night, it becomes evident that the developers have taken influence from a wide range of horror films, video games, and literature and woven them together into an experience that intrigues right from the very start. The game is set in the 1930s in the midst of the Great Depression, and players are quickly introduced to the main character who heads out on the road after a night of boozing at a jazz club. In a sudden flash of light he sees a woman in the road and veers out of control in an attempt to avoid her, crashing his car into a tree. After that Silent Hill style introduction, the main character finds himself slightly wounded from the crash and heads to a nearby mansion in search of help. The mansion, as you might expect, is appropriately creepy and as the player enters it they find themselves locked in by a mysterious force. An attempt to phone for help doesn’t connect, so you must make your way through the mansion and figure out how to get out. Although there is electricity, it’s fairly spotty and the lights have a tendency to turn off on a regular basis, so your main source of light are matches that are scattered throughout each of the rooms. As you explore it becomes clear that some very sinister things have happened in the mansion, and that there are some terrifying ghosts trying to keep you from discovering the truth. I don’t want to give away too much of the storyline, as giving away specific character names or other elements would spoil the surprise. White Night’s storyline merges elements of psychological horror with traditional ghost scares, and wraps it in a film noir narrative. It works well, and while there are some cutscenes (usually at the end of each chapter) the majority of the backstory is discovered by finding journals, letters, and newspapers that are scattered throughout the environment. Players begin to get a handle on just what happened in this mansion and who inhabited it and this gives the story some additional depth. Sometimes when games leave a lot of their backstory to logs and diaries it doesn’t always work, but OSome has written each one in a way that makes them pull the player further into the world. What initially starts as an attempt to find help after a car accident and get out of a mansion you are trapped in soon becomes a mission to discover the truth behind the horrible events that happened within the mansion walls, and it’s an engaging if sometimes predictable ride from beginning to end. White Night’s able to pull it off with a wonderful sense of tension, as even though there are still quite a few jump scares where you’ll suddenly encounter ghosts there are plenty of rooms where it’s creepy just standing in them and it is unclear as to whether something will jump out at you or not. This is a game that follows the older survival horror style, so you have no direct way to combat the ghosts you encounter while exploring. Gameplay is split between exploring each of the rooms and solving puzzles, while avoiding the spirits that want you dead. Keeping each area well lit via the use of matches is key, because if you stay in the dark for too long your pulse begins to race and eventually you succumb to the darkness and are forced to restart. Your character can hold twelve matches at a time, and there are plenty of additional match boxes scattered throughout the mansion. I’ve seen some people complain about not having enough matches on a regular basis but never ran into this problem myself, as some careful planning and resource management had me well stocked throughout the majority of the game. There is a bit of risk involved though, as there are certain situations where lights can be activated and you will need both hands to open a chest or move a drawer, which may mean you’ll need to put out the match you just lit. Additionally, sometimes when you go to strike a match it won’t light so you may end up wasting a couple while desperately trying to light up a room. It’s an interesting mechanic that fits well with the black and white visual style, and there are some moments where you’ll likely panic as a ghost is chasing you and the match goes out as you’re running away. Whenever you’re plunged into complete darkness it’s tense and foreboding, and to me that’s a sign that a horror game is doing something right. But at the same time, I never felt like I was truly in danger of running out and encountering a situation where I might have to use my last match and end up dying in the darkness. After the first hour or so, you start to realize where the best locations to stockpile matches are and if you don’t run around everywhere they don’t go out quite as quickly. A significant portion of the game revolves around revisiting areas to go into rooms that were previously inaccessible, and as long as you’re okay with dodging some ghosts it’s not that difficult to restock on a regular basis. But I suppose I can’t fault White Night for that too much, as being too restrictive might have made it hard to convince most people to see the game through to the end. Saving is handled by locating armchairs in various rooms and lighting candles or pointing lights at them so that you can rest in an illuminated space. It’s important to note that whenever you do so your character will put out his match, so plan accordingly. Ghost can only be killed with electricity, so making your way through some of the rooms will require figuring out how to turn the lights back on. It isn’t always possible to do this though, so there are still certain areas where you’ll need to avoid them as you make your way through. Thankfully the ghosts are blind and you have to be within a certain distance for them to detect your presence and chase after you, so oftentimes you can take it slow and not have to run like a madman. Aside from this, progression in the game is based around solving various puzzles. Early on this is mainly inventory based, meaning you’ll need to find a key or specific item in one room and then take it back to another. But as you get to the later chapters the puzzles become more involved and there are switch/symbol ones and others that take multiple steps to solve. It feels very close to survival horror classics like Alone in the Dark and Resident Evil, and while there were a couple of puzzles that took me a few tries to figure out the game does a good job of giving you just enough information so you don’t get stuck for too long. White Night can be controlled with either a keyboard or controller, and I chose to stick with a keyboard for the purpose of this review. You can move your character using either WASD or the arrow keys, and interact with objects using the spacebar. Icons pop up on the screen whenever you’re near something that you can interact with, making the game avoid becoming a pixel hunt. Pressing U makes your character run, and enter lights a match, with repeated taps of the enter key putting out a lit match. It’s a control scheme that’s simple and works well, and the reliance on only a handful of keys makes it easier to focus on the task at hand rather than getting bogged down by the controls. However, what will likely frustrate quite a few players is the game’s fixed camera angles. Much like the survival horror games of old, the environments are pre-rendered and the camera switches on a regular basis, meaning you’ll be moving in one direction and then suddenly have to re-orient yourself when it changes. Thankfully you’re not quite dealing with tank controls when it comes to turning around, but it can be frustrating when being chased by a ghost. This is especially true towards the end of the game when there are sections where you’ll need to avoid ten to twelve ghosts in a single room where the camera changes multiple times, and it can also be easy to get stuck on some of the architecture. It’s a deliberate decision by the team at OSome that recalls older survival horror titles, and I do think that those who have spent a good deal of time with Alone in the Dark, Resident Evil, or Silent Hill over the years will be able to adapt though. The visuals are what really sets White Night apart from so many other horror games, and OSome is able to continually capitalize on their unique style throughout the entire experience. As you’ve likely seen in screenshots and trailers, the entire world is in black and white which creates a stark contrast between light and dark. This is not only used in the puzzles, but gives the mansion a distinctive look where certain areas are bathed in moonlight and others are shrouded in complete darkness. There are a lot of sights to take in as you explore, as there is plenty of artwork and mysterious lunar/esoteric symbols scattered about. I did find that the environments tended to be more detailed then the character models, as when the cutscenes zoomed in on the main character or one of the ghosts the models seemed to look a bit off to me and didn’t have quite as much detail as I’d expect. The framerate is consistent, which is important during the chase sequences, and as a whole the graphics were consistent aside from some shimmering and aliasing issues with some of the shadows. The developers were able to do a great job of using the black and white look to capture the film noir style while still offering some terrifying horror elements, and there are some scenes that I’ll likely still be thinking of in the days to come. Another area that OSome has nailed is the audio. The only voice acting comes from the main character during the cutscenes, so for the most part the only audio you’ll hear are ambient noises and his breathing. White Night does its best to creep you out with every door creak and the sound of rain pouring down on the mansion roof, which culminates with the terrifying shriek of a ghost when you encounter them. In between these creepier moments, there’s also an emphasis on jazz and there are sections in the game where you’ll play a jazz record or a piece on the piano. It fits in with the time period and adds to the sense of style that the game has, Although you may not always be able to pay attention to all of the audio because you’ll be too busy trying to avoid ghosts, there are key sections that will grab your full attention and pull you further into the world the developers have created. It took me a little over seven hours to play through White Night, and that was without collecting 100% of the diaries and newspapers. OSome has done a lot of things well and merged a whole slew of different horror elements with a film noir aesthetic that gives their particular take a feeling of its own. This is a game that demands a bit of its players though, as you’ll have to deal with the old-school fixed camera and plenty of cheap deaths (particularly towards the end when the amount of ghosts gets to be a bit much) along with some inventory management and exploration. To get the most out of the story you’re going to need to search every nook and cranny for diaries and it does end up being a bit predictable by the end, which I think may keep the game from being regarded as a new classic. But it’s still a mandatory purchase for anyone with an interest in horror or the older survival horror style, and an impressive effort from a smaller team that has been able to weave a concise and complete narrative.